Disney has worked hard over the past several years to bring their newest town to life. Disney Springs is now a bubbling, living, breathing Florida town built along the magical Florida springs. 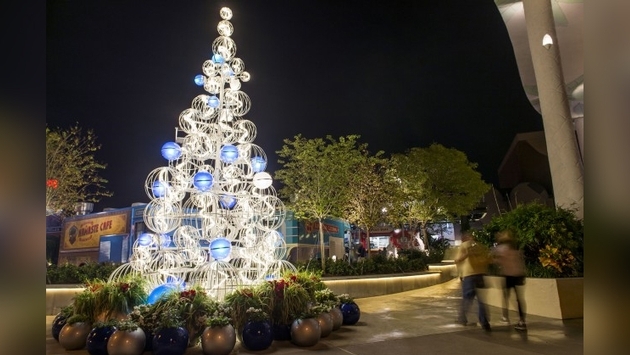 With the construction nearly finished, and most of the area open for business, this holiday season will mark the very first Disney Springs Christmas, and they are celebrating in a big way that is distinctly Disney. Dining and shopping aren’t the only things on the holiday agenda, as the area is brimming with holiday cheer and fun. The first big news is that there will be an all new show at Disney Springs later this holiday season, featuring drones! That’s right, we’ve already seen testing of it happening and it’s going to be one amazing new show. Drones will scatter all around the sky for an amazing mini-symphony set to music and light. “Starbright Holidays-An Intel Collaboration” uses brand new Disney holiday music and will come to life every night over Disney Springs. The show is rumored to begin on Nov. 20, just in time for Thanksgiving. For a limited time, until Nov. 19 a special Nutcracker show will be happening in front of MAC Cosmetics in Disney Springs. The show will feature a ballet of rosy-cheeked Nutcrackers, Ballet Dancers and Sugar Plum Fairies performing several times daily. The show is to celebrate the new holiday boxes from MAC Cosmetics, but it’s a free show, and it’s the Nutcracker, so you can’t really go wrong. Beginning Black Friday, Stitch will take over Christmas in a big way as Disney Springs will roll out Stitch’s Holiday Gift Hunt. The new scavenger hunt will be available in select Disney stores, and will send guests scrambling through the four neighborhoods of Disney Springs to find holiday cheer with Stitch. Complete the hunt, get a limited-edition button! Disney Springs is doing something else that is a first for Walt Disney World, they are offering huge savings on Black Friday. The traditional start to the holiday season is coming to Disney Springs in a big way, with over 60 stores and restaurants participating in the huge shopping event. The stores will open extra early and will offer massive savings to Disney guests. The real centerpiece of the holiday season, however, is the entertainment that will be offered in the new venue. First, there are the huge collections of Christmas lights and decorations all over Disney Springs. There will also be wandering performers, and mini shows all over the area. -Carolers (near Disney’s Days of Christmas and Santa’s Chalet). If that wasn't enough, there will be a new Christmas Tree Trail, which features 15 uniquely Disney themes, Christmas music and even a light sprinkling of snow! Of course, it wouldn't be Christmas without Santa, who you can meet and get pictures within his very own Chalet. Guests can make a reservation, and be notified when it's their turn to meet Santa. Of course, he will be very busy with his holiday deliveries, so Santa Goofy will step in beginning Dec. 24. The restaurants of Disney Springs will round out the holiday season with special menus and offerings at select restaurants. The holidays will shine at Disney Springs for the festive new celebration that brings a new touch of Disney Magic!